OK, I promised a moderately priced system this time around, so let's pick a system by pricepoint. With computers of this type, we often find that people want the best system they can get for X dollars, no matter how sh... er ... compromised the quality is. Well, these machines, not all from the same vendor, were not very good. Power supplies failed, CD/DVD drives failed to open, systems just "died", network interfaces failed, and the like, mostly around the 1 year mark, but some after. The non-profit organization which purchased these systems ended up replacing something less than 1/2 of them, and of course, they are waiting anxiously for the rest to go belly up. Dell has what I take to be a similar system for sale now, a Vostro 220 Mini Tower, for $309, which has an Intel 2.66 GHz Dual Core Processor, 1 GB RAM, a 250 GB hard disk, DVD+/-RW, Vista Basic, integrated video/audio and gigabit network. I personally do not know how reliable a system this is, but it seems similar to other low-pricepoint systems. It's just barely adequate for modern desktop tasks like web browsing, office software, basic publishing and so on. MWAVE has an ASUS barebones mini-tower system for $278 with the same Intel 2.66 GHz Dual Core Processor and 2 GB dual channel 800 MHz RAM. Add a $20 Sony DVD+/-RW drive, and one of those extra XP licenses you have hanging around (you do have them don't you?) and you're good to go at $298, whoops, and a hard drive for $44, the very nice Western Digital 250 GB WD2500AAKS. We are at $342. Sadly, you do take a hit if ou have to buy an OEM license for Vista Basic SP1 for $87, bringing the total price up to $429, including shipping of $26, $455. Still the Dell would require a $20 upgrade to go to 2 DIMMS of dual channel RAM and 2 GB total bringing the total price to $329, including shipping of $35, $364. Now the ASUS barebones system has what I believe to be better quality, longer lasting components, so you have to decide whether the $91 extra you pay for the ASUS system is worth it. I think it is. Of course, if you do not need to buy the OS, and you have XP sitting around the office, you are at a wash pricewise. How do you build this machine? Well, just the same way you built the high-end system in Part 3, only you don't have to work so hard, but just add the CPU, the memory, and the hard drive. That's the nice thing about a bare system -- the motherboard and power supply are already together. OK, you may or may not believe our low end system is cost effective ... but what about a slightly higher end system with a faster CPU, more RAM, a bigger Disk, and so on? We've already seen that a very high end self-built system does have a substantial, immediate price advantage, but what about something in the $900 range? What can we build for that price? Well for $455 we can get a barebones ASUS 4 core AMD Phenom 2.5 GHz 4 GB system that will run rings around the Vostro E8600 when heavily loaded, 4 CPUs in one will do that, and offer comparable performance lightly loaded. We are adding the same hard disk and optical drive, but we are adding Windows Vista Ultimate for $179. Shipping cost is the same, $26. So our total delivered price is $724, a clear winner. We have a savings of $123 and a much nicer system. It seems clear that, as the cost of the system goes up, the more advantageous it is to build your own computer. You get a cheaper (cost-wise) machine, or a better machine, and/or, both. Now it's true that any piece of hardware can fail, and the computer you build can certainly fail, too. My personal experience in that respect has been good, that is to say, I haven't experienced many failures of systems I've built from parts like the ones I've mentioned here. And, anyway, should something die, hey, all of the components are off-the-shelf, and ... you can pop in a new one. And those parts have warranties, too, anywhere from 1 to 3 years in most cases. At the very low end, you might argue the point, since the initial cost is higher, but our experience at that low end from major vendors has been poor enough to make us want to factor in a significant replacement or repair cost. I'm going to talk about other aspects of building systems, testing, monitoring software, etc. Stay tuned for Part 5 of 4 ... umm ... that is, the Epilogue. So let's talk about putting this sytem together. What do you need to assemble the machine? What are the pitfalls? How long will it take? What skills do you need? You need a good standard medium Philips (cross head) screwdriver, a good 3" X 6" table top with a soft, static-free work surface, a non-dry or humidified environment with at least 40% humidity (don't want to zap the motherboard, CPU or memory), and small containers for the parts, screws and little bits that come with the machine. Don't hurry assembling the machine! Take your time. Most everything is straightforward. Assembly will take a couple of hours. Maybe as much as 4 hours if you get stuck a few times. Can you do this? If you have replaced parts in a computer, and you know this difference between a CPU and a video card, YES, you can! You can have MWAVE test the CPU/Motherboard/Memory combo, and the Power Supply for a nominal fee, which is well worth it. Then you know the important subsystems work. You're going to lay out the case and parts on a towel on your table -- keeps the parts from rolling around, don't you know, as well as other items you will need soon, e.g., the Power Supply, the Motherboard, the DVD drive, and the Graphics Card. Examine the parts lists and diagrams for these components, and dump and segregate the bagged fastening hardware, such as screws and other small bits into shallow plastic containers or the like near the related component. If you have any static electricity buildup, postpone working 'til another day when it's more humid and/or buy a cheap wrist strap grounding kit and work on an anti-static mat, also readily available on-line. Lay the motherboard out on the antistatic bag it was packed in, and examine the Intel CPU, leaving it in its plastic packaging until you are ready to lay it in place on the motherboard. Underneath the body of the fan is a heatsink with a decal of thermal grease applied to it which will lie between the CPU and the fan heatsink to provide an optimal mating of the 2 surfaces for heat dissipation, so be gentle with the bottom of the fan assembly when attaching it to the motherboard. Following the boxed instructions included with the Intel CPU, you will mount the CPU on the motherboard, and the add the fan, also according to instructions. Then add the memory in the slot order the motherboard instructions require; the memory only mounts in one direction. Be especially careful with the CPU, the memory, and the motherboard, since these are the most easily damaged parts. You are ready to mount the motherboard in the case. Most off the little brass standoff nuts are already attached to the bottom of the case. So you just need to snap in the motherboard supplied I/O shield to the back of the case, and then drop the motherboard in place so the holes in the board line up with those in the standoffs and the I/O ports on the back of the motherboard push through the I/O shield holes. At this point fix the motherboard in place with a supplied Philips head screw fairly loosely and then add the other screws, finally tightening them all. See that the CPU Fan power cable is attached to one of the nearby sets of fan pins. Attach the case connections to the motherboard per instructions. ASUS makes this easy with a removable multi-pin connector. Also attach the case fan cables to the motherboard according to the ASUS instructions. Now add the Power Supply and snake in the cables to the drive cages and the motherboard. Attach the main and auxiliary power cable from the power supply to the motherboard. Now, I would use the top 5-1/4" drive bays to add the drive cage and the DVD drive, with the DVD drive on top. Add the DVD drive and secure it to the case. Attach the power supply cables, and the ASUS supplied ICE cable from the motherboard to the DVD drive. Add the RAID cage, secure it and the attach the power supply cables. Now add the graphics card to one of the PCIE 16 slots where there appears to be the most room, hopefully well away from the CPU, and remember to attach the 8 pronged power connector to the card per the instructions, since you've read them already! Now we're ready for a quick test. We're going to see if the system will display to the graphics card, pass its few attached peripherals, and boot to the BIOS firmware. Before we do that, check all of your work -- all of the the power cables, fan cables, and chassis cables to the motherboard. Connect a monitor, a mouse, and a keyboard. Make sure the Power Supply switch on its back is in the OFF position, plug in the supplied power cable to the wall and supply, turn the power supply switch on, and look for a momentary LED flash on the motherboard, and perhaps a quick spin of the power supply fan. Great, now give the power button on the front of the case a push, and the system should power on. If it does, great, if not, check that you attached the power-on cable from the case to the correct pins on the motherboard. Not sure? Use the switch on the motherboard to power on. If that works, you attached the chassis cable incorrectly, if not check your Power Supply cables again. OK, the system powers on, and gives you a few messages, complains about its configuration and offers to take you into the BIOS. You accept. Now, there is nothing we want to change in the BIOS until we are certain the computer is working correctly, except perhaps the boot order of the devices we have connected, that is which possible boot device is checked first on reboot or boot. We want the first device to be the optical or DVD drive, so we will navigate to the end of the menu and make sure this is so. Meanwhile, this is a good opportunity to check out the firmware options available and check out the default configuration of the system. you might want to go back to the ASUS manual's section on the BIOS and overclocking to see if it makes more sense after having seen the BIOS up close and personal. Save the BIOS configuration and reboot. Once the system comes back up, power it off by holding down the front panel PS button until it goes dark. Now it's time to add the drives. It's simple you take them out of their static-safe bags and slide them into the front hot swap slots. Now attach the cables from the main motherboard SATA connectors to the connectors at the back of the Promise RAID cage. Reboot the system and see if the Intel ICH10 SATA BIOS recognizes all of the drives. Good! No? OK, check your cables and the orientation of the drives in their slots. Good! We have a choice now. We can configure the onboard Intel RAID to allow is to install Vista, or we can go straight to the Adaptec RAID, which is better, and install to that, as a test of the system. I say pop in the Adaptec 5805 and install to that. To do so , we have to turn OFF the Intel ICH10 RAID however, because it interferes with the Adaptec card. Boot to the BIOS -- you'll see the option to depress the "Del" key to invoke the BIOS on power on -- and travel to the Menu item for the Intel SATA RAID and DISABLE it. Save your settings and reboot. Turn off the computer, and add the Adaptec 5805 to the 3rd PCIE 16 slot (the one farthest away from the CPU), connect the drive LED chassis light cable to the pins on the card, and add the power cable to the connector at the end of the card. Disconnect the SATA cables from the RAID cage and attach one of the 4-way SATA Adaptec cables to one of the connectors on the Adaptec card and 4 of the connectors at the back of the Promise RAID cage..
Power on. As the system boots you will now see the Adaptec firmware message, and you will have an opportunity to hit "CTL-A" to invoke it. Read the Adaptec Instructions on building a RAID 10 logical volume from the 4 WD drives. OK, now do it. Make it "instantly available", save it and reboot. The RAID 10 volume will build in the background while you install Vista 64. Place the Vista 64 disc into the drive and boot to the install program. Make a clean installation to the entire 2 TB volume of available space. Vista comes with a driver that recognizes the Adaptec hardware, but you will want to upgrade to the latest driver and 5805 firmware after the Vista OS has installed, from either the Adaptec CD or website. You will also want to install all of the ASUS specific motherboard software that come with the motherboard on the accompanying CD, as well as the ATI 4870HD driver and interface software on the Sapphire CD. Once Vista has installed and you have the hardware specific drivers and software upgraded you are essentially in the same position you would have been if you had purchased a computer from Dell or HP or whomever, and you can take it from there. One final note on being aware of the operating conditions of your self-built system. It is important to see that the air paths inside the computer from the fans and the drives and the CPU to the exhaust of the case are clear, so that the hot air can be easily vented. Also, for peace of mind, I like to know what the temperatures in voltages inside the system REALLY ARE. There is a very nice piece of software that will install to the Vista Sidebar and give you a constant readout of CPU core temps, motherboard temps, and various voltages, and a whole host of other info, so you can instantly be aware of any departure from the norm, and that is Lavalys Everest Ultimate Personal Edition, which is $35, and so well worth it, that it will pay for itself in preventing you from ignorantly soldiering on while your CPU fries. OK. Congratulations! You are done. Now you may as well put the side panel back on the machine and make sure all of your screws and parts are put back away. Check the fan noise and CPU temps after you have (re)assembled everything to make sure you haven't blocked anything. You can check the motherboard and CPU temps by booting to the BIOS and looking for them in the menus. Look for resting overall CPU temp of 40 to 45 deg C, and individual Core temps a bit above that. Operating Termparture ranges are available on Intel's web site. But you don't want to push the cores much byond 90 deg C.
I'm going to wait until next time to discuss building a moderate system, but I will say this -- now that you've built a high-end system, the lesser one is easy. I'm going to choose mail-order parts from a reputable vendor, in this case, MWAVE. Now, I'm going to want a high-end system for personal and office use, not for playing games, at least not unless my 7 year-old demands it, so I will be most interested in the speed of the machine, minimizing latency, that is its delay under load, reliability, ease of maintaining a low temperature, and noise. I do a lot of photography and I have many hundreds of thousands of photographs, and I do a lot of batch work on, and to, photographs for clients, and I often load my systems with many disk intensive tasks all at once. So I care not only about the speed of the disk subsystem, but also its speed when heavily loaded. I don't mind if the machine has to wait for me -- I cannot stand WAITING FOR THE MACHINE. We will bypass the onboard Intel RAID and standard SATA disk controller and upgrade to an Adaptec 5805 RAID controller capable of addressing up to 8 SATA or SAS disks. It has an onboard processor to offload disk related tasks from the main CPU and an optional battery backup for the 512 MB cache. I love it. You want to to copy 4 GB of 3, 000 files, it's a work of a few seconds. Or do tasks involving such things12 times simultaneously, that takes just a minute or 2. And the machine still responds nicely to the keyboard and mouse under load. Wonderful. We will choose 4 Western Digital 1 TB (1000 GB) RAID specific SATA drives for a RAID 10 internal subsystem, which have worked very well for us. The motherboard will be an ASUS RAMPAGE II Extreme X58 chipset board to accommodate the latest Intel Extreme 4 Core processor, the i7 965. We will mildly overclock this CPU from 3.2 GHz to 4 GHz, but still be able to use the stock fan, because the CPU runs fairly cool compared to earlier, larger chips, and because the motherboard has a sophisticated heat-pipe based temperature control and distribution system. The ASUS motherboard comes with a fairly decent sound card that takes up 1 PCIE slot. Memory will be OCZ DDR3 2000 MHz 4 GB (2 X 2 GB) and we'll have 2 0f those, and to take advantage, of that memory beyond 3 GB, we'll be using Windows Ultimate 64 bit SP1. Power Supply will be an OCZ/PC Power and Cooling 750 watt Silencer or an Antec NeoPower 650 (watt) modular supply so you only use the cables you need and keep the inside of the case clean. You can buy a power supply tester from MWAVE for about $10 -- then you know it's good. Graphics card is a Sapphire ATI Radeon HD470 512 MB unit -- you can always get another card and strap them in Cross-Fire if you REALLY need to warp out in HALO. The RAID cage is a 3 half-height, 4 drive unit that uses no trays and will fit directly into the front drive bay opening of any case offering 3 half-height or more openings, and that is thePromise 4600. If a drive fails under RAID 10, you will get an audible warning, and all you have to do is pop out the failed drive, which will be indicated by the Adaptec software, and pop in a new drive, after which the new drive will auto rebuild. Wonderful. We will need some kind of DVD/CD drive -- they are so cheap these days -- we'll take a Sony rewritable DVD/CD. The case itself will be the Antec P182 which is quite large for a mid-tower case, and very quiet as well, even with 3 X 120 mm fans, 2 more fans optional, and external fan controls. It''s black, and it sheds heat very well. You can feel free to modify the above parts in case you do not like my choices, but you may run into some fit issues, such as rear extension of the RAID cage interfering with cable routing or some such, and you may run into heat dissipation issues as well. One optional item would be a server class Network Card (NIC), such as the Intel Pro 1000/PT Gigabit PCI Express card, which will offload a lot of network traffic processing from the quad core CPU, although for less than multiple streaming downloads the on-board network interface is fine. OK, that doesn't include shipping, or a keyboard and mouse, or a monitor, but you can pick the accessories you like and shipping will be cheap. In a minute I'll give you some tips on how to put it together, but first let's take a look at a top of the line Dell XPS 730x H2C, which, absolutely stripped, starts out at $4399, and runs at less than 3.8 GHz while our machine, with the same processor runs at 4.0 GHz. The Dell does not include 8 GB memory, 2 TB of RAID, Vista Ultimate, the ATI Graphics, or the high-end Adaptec RAID controller. Comparably equipped, the Dell would run $5400, but would still not have the Adaptec 5805 SAS which Dell does not offer, nor can you add more memory. Even then, it will run more slowly. If you want to make a more direct comparison you could take out the Adaptec card and drop the price of our system to about $3200, and then it will compare fairly directly to theDell at $5400. Well, OK, to be fair, Dell gives you a great warranty -- and you PAY for it. Also true is the fact that, if you break something on your self-built system, you own it, even if it's under warranty. Now the Dell has a special CPU cooling system with a refrigerator type Peltier Effect heatsink to draw heat from the CPU, and it does a great job. You can even buy a similar system from the company Dell licenses it from, Coolit Systems, which makes the Freezone Elite, for a roughly $330 street price. 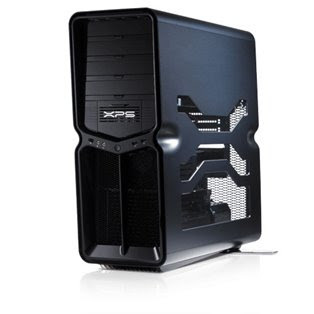 But our system with its great ASUS motherboard and well ventilated case, DOESN'T need it. Cools just fine at the 4 GHz overclock with the Intel supplied fan. Our system is not as pretty, well, ours is more ... hmmm ... understated. Think of it as a SLEEPER, you know, it looks like, say, an Acura, upscale but quiet, but it's REALLY a Porsche 911 Twin Turbo. Many of the people maintaining a small business network of computers and their related equipment are not computer professionals, but business persons drafted by necessity into the care of the systems on which their livelihood depends. Nevertheless, it is possible to take pleasure in the equipment and the care of it, and of course there is more pleasure to be had when the problems and the pain are small. One of the pleasures you can have, as your skill grows, is in the making and using of a machine you have built yourself. Those of us who maintain systems have had to do enough minor surgery over the years, so that we know how to replace drives, cards, power supplies, memory, and so on, and it's not such a stretch to take some well chosen parts and cobble together a very nice system indeed. It may or may not be cost-effective, although I think it can be. It will take time, but mostly time well spent. 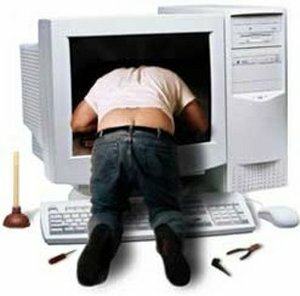 It's true that you do not get a warranty on the system and you can't buy a same-day on-site warranty for your own computer, but any part that fails will be under the maker's warranty, and you can do the repair or replacement yourself. Right? Right. Just for fun, I'm going to compare 2 very nice systems from Dell Computer, one high end, and one moderate in price and construction with owner-built systems from off-the-shelf parts, and see how they add up.